The two hackers who last month announced plans to reveal details concerning how to hack a Toyota Prius and Ford Escape have gotten together with Andy Greenberg from Forbes to demonstrate the technique and just how much trouble they can cause once they have hijacked a vehicle’s computers. 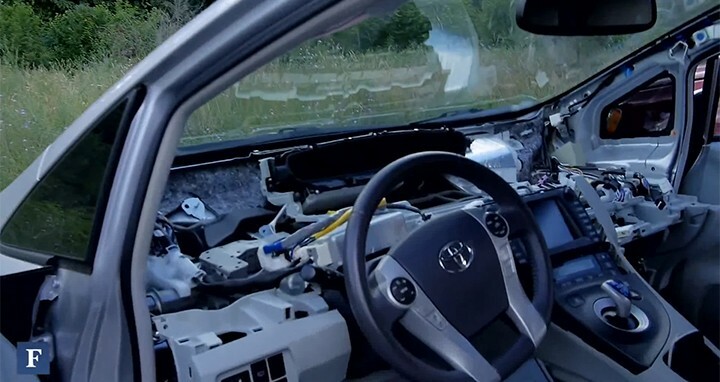 In the video below, Chris Valasek and Charlie Miller get into the backseat of a Prius with a dismantled dashboard and ask Greenberg to start driving. The two hackers are giddy in the backseat as they cycle through a series of attacks that trigger various functions of the car. The hackers were able to cause a variety of events to occur that ranged from mildly annoying to potentially dangerous. Seemingly with the push of a button from the back seat, the Prius’s horn sounded, and the seat belt’s snapped tight against the chests of the passengers. Most of the attacks operate by tricking the car into thinking that an incident is occurring. For instance, the seatbelts can be suddenly made taught using the vehicle’s pre-collision system by ‘forging’ that the car is about to be in a crash. The ‘tricks’ with more nefarious potential include the ability to jerk the steering wheel to one side by triggering the automatic parking assistance, and completely disabling the brakes. Valasek says that there are upwards of 35 electronic control units (ECUs) in the Prius, and nearly every one of them serves their own function. By compromising these systems individually, an attacker can manipulate the car in unusual ways. Fortunately, for now, it seems that the attacker needs to be inside the car to operate the hacks.